Abstract: The jet black Aopen H420 is a compact desktop chassis intended for use with MicroATX or FlexATX motherboards. It is large enough that full height AGP and PCI cards can be installed too. The term "SI" is used in the computer industry to describe the "System Integrator;" which is basically a company that takes a whole bunch of different components from the off the shelf, builds a PC with them, and sells it to consumers under their own brand name. For the most part, System Integrators shoot for the 'mainstream markets,' as that is where the most consumers are. MicroATX motherboards with integrated graphics are the darling of the System Integrator, and cases such as the Aopen H420 we are taking a look at today, provide a quick and eye catching enclosure for their cost conscious customers. The jet black Aopen H420 is a compact desktop chassis intended for use with MicroATX or FlexATX motherboards. It is large enough that full height AGP and PCI cards can be installed too. Depending on the application, the Aopen H420 is versatile enough to be laid horizontally, or standing in a vertical orientation. 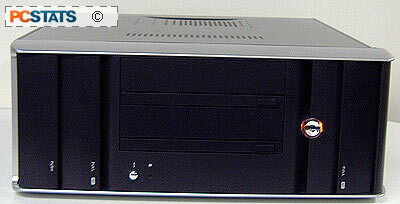 Two 5.25" CDROM bays are positioned up front, and easily accessible from the vertical position when the case is upright. Two 3.5" FDD bays are also accessible, meaning you could have a Floppy drive and a Zip drive installed, or even just install two more hard drives and forgo the removeable storage option entirely. Behind a little plastic locking cover along the bottom of the bezel is a set of common multimedia ports; a headphone and mic jack, two USB2.0 ports, and room for a IEEE 1394 Firewire header (though not installed). On the inside of the case are two dedicated 3.5" HDD bays, for a total of six drive bays altogether. 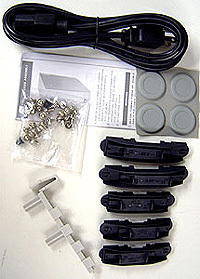 mounting screws, 300W powersupply, plug, 70mm case fan and instructions. The two 3.5" floppy bays are covered by simple plastic covers that you'll need to flip up to get access to the drives, or close if you don't want to look at them. The two 5.25" CDROM bays use an integrated bay cover of the type where the CDROM slides in behind, and the case only opens up to reveal the drive when the CDROM tray is open. This provides a sleek look, but if you're accustomed to using the headphone jacks on your optical drives, you're out of luck. The headphone jack a little lower down can make due just as well, assuming the installed MicroATX motherboard has decent onboard audio. With so many chassis being produced right now for the 'case modder' market, it can be difficult to walk into a computer store and just buy a plain black case which is suitable for use in an office, school or small apartment. The all-steel AOpen H420 case does seem to have been designed with these applications in mind, and retails for an affordable $55USD, with power supply.